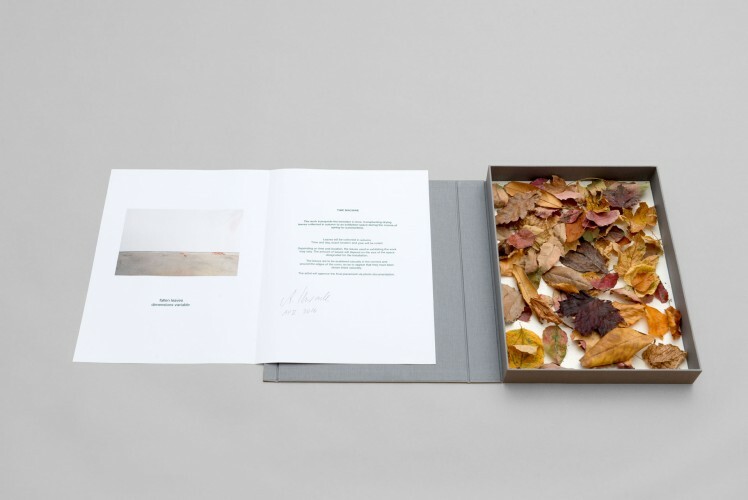 Instructions: "The work transports the beholder in time, transplanting drying leaves collected in autumn to an exhibition space during the course of spring-to-summertime. Leaves will be collected in autumn. Time and day, exact location and year will be noted. Depending on time and location, the leaves used in exhibiting the work may vary. The amount of leaves will depend on the size of the space designated for the installation. The leaves are to be scattered casually in the corners and around the edges of the room, so as to appear that they have been blown there naturally. The artist will approve the final placement via photo documentation."